As LA Unified continues to lose 12,000 students every year, administrators will be notified of expected job losses, restrictions could be made on how to spend one-time funds coming from the state, and labor partners will be called on to be part of the solution. 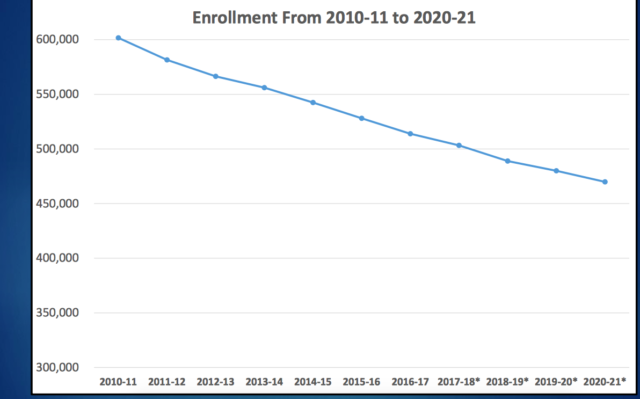 Next year’s projected enrollment decline was reported Tuesday by Chief Financial Officer Scott Price during a budget update to the school board, which made no decisions on how to offset what equals a loss of about $130 million a year — roughly what the district receives in per-pupil funding for 12,000 students. He reminded the board of the coming deficit in school year 2020-21, projected at $245 million, and that the board must decide how it will stay out of the red. Board members discussed various options, including closing schools, and asked for examples of what other school districts are doing to offset deficits. Board President Mónica García said that next week Interim Superintendent Vivian Ekchian will discuss with the board a plan to send RIF notices to 1,600 administrators. The same number of notices were sent out last year, and in the end, 115 employees lost their administrative jobs but most were reassigned to other positions. The year before, 1,700 notices were given to administrators, but all of them ended up keeping their jobs. Last year, Superintendent Michelle King mandated a 30 percent reduction in budgets from all administrative departments. Ekchian said she will be discussing with the district’s labor partners the loss of enrollment and the need to address the upcoming deficit. “We will also be working with the labor partners because this is a challenge we all face together, so we will have to come up with solutions together,” Ekchian said. Price also said that the district will take back up to $100 million in unused money from school budgets at the end of the school year. Melvoin also noted that giving raises would also cut into the district’s attempt at lowering the projected deficit, which Price confirmed. García pointed to examples such as dual language programs that are attracting families and wanted to make sure they weren’t cut. Also Tuesday, in an afternoon closed session, the school board agreed to use the previous search firm to find a new superintendent. The choice will save the district at least $160,000, because a clause in the contract with Hazard, Young, Attea & Associates states it will conduct a search “at no additional cost barring expenses” if the superintendent leaves within two years. Michelle King, who is battling cancer, announced her plan to retire just six days before the two-year mark. Some of those forums held across the district yielded disappointing turnout. The district also conducted an online survey.